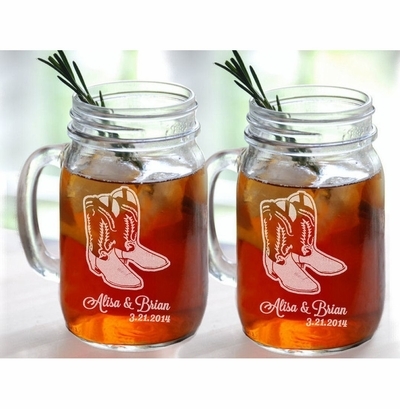 Cowboy Boot Country Western Design beautifully engraved personalized with First Namese and a wedding date. Perfect gift for a couple, boyfriend, girlfriend, husband, fiancee, wife or any lover in any combination! Personalized with first names and a wedding date. Artfully crafted in our Florida Keys Studio. A perfect gift for the classy couples, newlyweds, anniversary, Valentine&#39;s day, Boyfriend or Girlfriend or for yourself! Set of of 2 Mason Jars. Color: Clear Glass. Size: 16 Ozs. Diameter: 2 1/2&quot; &amp; Height: 5 1/2&quot; Dishwasher safe. Not for canning or for hot liquids.